A strong company is built like a skyscraper, Brad Brown, CEO of All-American Label & Packaging, explains. Without a stable foundation, it will be impossible for it to stand. All American Label & Packaging, based in Dublin, Calif., with a second location in Memphis, Tenn., began setting its foundation as a label printer and converter in 1995. But despite its established roots in the label industry, Brown explains the business has evolved into a print provider offering much more than labels. Like most label companies, All American’s printing foundation is in narrow-web flexography, but Brown explains that he has never shied away from acquiring new tools to get a job done. The company was an early adopter of digital technology, installing its first HP Indigo digital press in 2006. Brown says he has since enhanced the company’s digital capabilities, upgrading his original 4000 series presses to a pair of HP Indigo 6800 digital presses. But as All American continued to expand its business beyond labels, Brown prioritized bringing in the right tools for the right jobs. For example, he notes that when the company first began to dabble in shrink sleeves six years ago, it brought in 10-color, 17˝ servo-based film presses from OMET, which were better suited for those applications. And while All American had years of experience printing digitally for its customers in the wine market, a need for longer runs led to the company adding a Codimag waterless offset press five years ago. In 2018 alone, All American Label & Packaging conducted an unprecedented technology adoption period. It started by boosting its web offset capabilities with a Nilpeter MO-4, a high-end press that Brown explains is ideal for serving customers in the wine segment. Extending beyond labels, however, All American also brought an EFI VUTEk grand-format printer on board to supplement its signage capabilities and to provide corrugated and display printing. Brown says that the company has been producing signage for years under its All American Signs division, and adds that the addition of the VUTEk will allow the firm to add more high-end applications to its wide-format capabilities, supplementing the output it produces on 54˝ and 72˝ Roland printers. 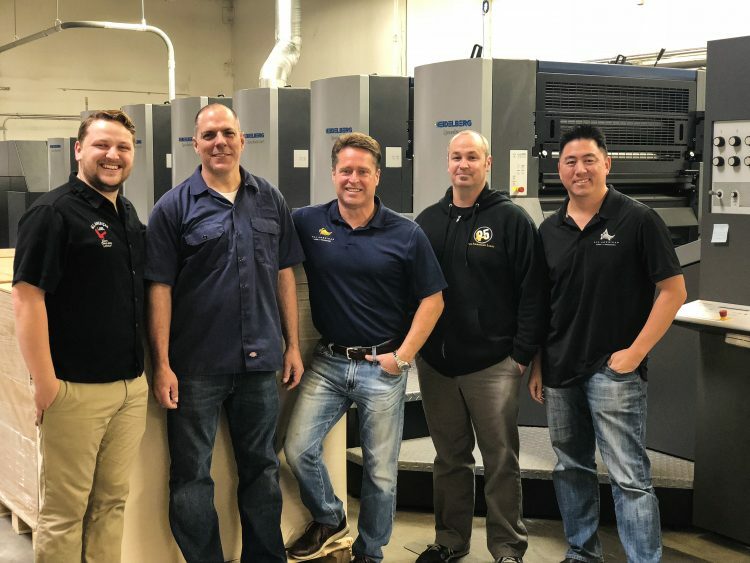 Pictured, from the left, with the Heidelberg press are: Colten Brown, operations manager; Mike Anderson, plant manager; Brad C. Brown, CEO; Brent Peacock, offset production manager; and Brandon Warren, GM. This year also marked All American’s expansion into sheetfed offset printing, with its installation of a Heidelberg Speedmaster CD 102-6+L press, along with a Heidelberg Suprasetter A 106 platesetter and an Easymatrix 106 CS diecutter. Brown says that with the addition of the Heidelberg equipment, the company has grown its packaging capabilities by taking on folding carton work, and entered commercial printing segments, including catalog printing. It has also allowed for the addition of cut-and-stack label capabilities. “With the [EFI] grand-format and with the Heidelberg, we’re able to provide products that we were never able to do before,” Brown says. As print segments continue to converge, and companies expand beyond their traditional application niches, adopting a combination of technologies will be inevitable for many printers. Having experienced the adoption phase for multiple technologies, Brown explains that establishing a company culture that embraces change and welcomes new technology is imperative to success. Brown points out that a learning curve can be expected with any new equipment install, but with the right attitude and buy-in, employees can become well-versed in a new technology. Though new equipment and processes can provide growing pains, Brown explains that maintaining consistent transparency is essential to developing buy-in from staff. As long as employees understand the reasons a decision is being made and the benefits it will bring to the company, introducing change becomes less of a challenge. For example, Brown says that when new technology is brought into All American Label & Packaging, he makes sure that everyone understands how the new equipment can take on capabilities that were not previously feasible. For example, when the company upgraded its label presses, he made sure the staff understood how the new equipment would help the company keep up with customer demand. While Brown has led his company through its evolution in the technologies and products it offers, he says developing its identity to better match its portfolio was also important. Prior to this year, the company was known solely as All American Label, but rebranded as All American Label & Packaging as a way to represent that it is not restricted to just one product. Brown says that about a year ago, the company brought a creative director on board and tasked her with leading the rebrand to better represent the company’s new directions. He explains that it was important to maintain the foundation of the company name, along with the use of an eagle as the main image in the company logo, but that the firm’s identity needed to represent its versatility. With the rebrand in place, Brown says All American Label & Packaging will continue to innovate, finding new ways to serve its customers in ways that exceed the competition’s capabilities. In addition to its expansion in the label, folding carton, commercial and wide-format segments, Brown says All American now provides augmented reality services complete with 3D animation. Because the augmented reality app allows All American’s customers to collect consumer data and better understand who is using their products, Brown explains the service is another way All American’s versatility allows it to be a complete partner.